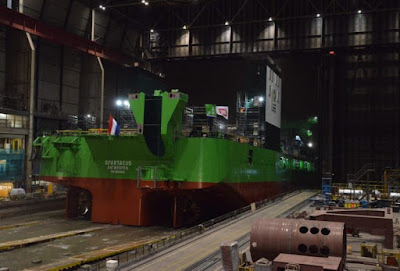 The world’s first LNG-powered cutter suction dredger has been launched at the Royal IHC shipyard in Krimpen aan den Ijssel in the Netherlands. The vessel, named Spartacus, is owned by Belgian dredging, environmental and marine engineering group DEME. The dredger boasts a total installed capacity of 44,180 kW, making it the most powerful cutter suction dredger in the world. Spartacus has four main engines that can run on LNG, marine diesel oil (MDO) and heavy fuel oil (HFO). The two auxiliary engines also incorporate dual-fuel technology. The vessel also features a waste heat recovery system, a one-man operated dredge control and a heavy-duty cutter ladder that can reach a dredging depth of 45 m.
IHC is known for its willingness to push boundaries to develop and produce high added-value equipment and vessels for our customers. The combination of power, size and innovation makes Spartacus a perfect example of such a project. DEME was once the first dredging company to put a ‘jumbo’ dredger in the market which has led to a new generation of dredging vessels. “As Spartacus will soon be the world’s largest and most powerful LNG-powered CSD in operation, DEME will again have set a new standard in the market,” IHC’s CEO Dave Vander Heyde said. 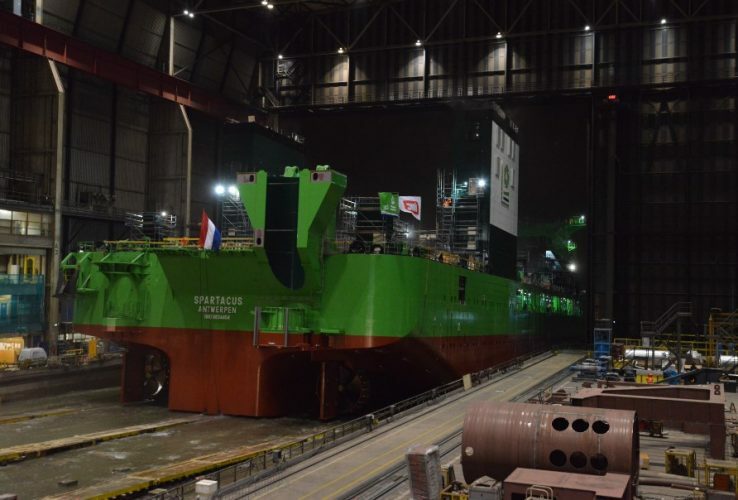 Once completed, Spartacus will join the dual-fuel dredgers Minerva and Scheldt River that were delivered to DEME in 2017. In addition, in October the company ordered two new trailing suction hopper dredgers and two split barges, reinforcing the fleet in 2020.